I have found the pace of my life has picked up lately. I realised today that it is only two weeks to go till I have oxygen ordered in Sussex for my holiday with my mother in law, as she has become since the wedding.I am looking forward to it and so are the kids but I am starting to panic a bit as well. I have done very little to sort things out, I had big plans.Today I got a shock when I realised how near it was.I have started the process by ordering all the medication and inhalers I use so that I don't run out. Have sent off my prepaid prescription card to be renewed as the government don't pay my medicine costs. In fact they pay me nothing but a half of the rate of incapacity benefit I would be due because I have a ill heath pension from when I was a Nurse. The other benefit I get is DLA higher mobility component and this is taken so that I can have a car by motorbility without which my life would be intolerable.I am worry about what will happen with the benefits under this government but don't get me started on that! There are lots of other things to sort out but at least I have made a start I have not contacted Harefields yet because, as I have found out in the past anything could happen before the date we have in mind. Anyone who read though the post at COPD Foundation will have read that I had a case of pseudomonas last year and it prevented our holiday going ahead, so it is two years since we have had a holiday,and I don't want to tempt fate. I would like to welcome some new people to the blog as my following numbers have increased thank you all for following and I hope you don't get bored with my ramblings. I would like to say a special hello to Rachy :-) who is further in the process than I She has had some ups and downs to put it mildly, since her own Double lung transplant in March of this year. You can read her story and follow her on the blog list and if you haven't I would suggest that you do. 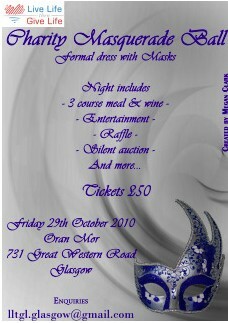 The other thing to mention is Tori who is also on the blog list is having a Masquerade Ball to raise funds for a very worthy cause Live Life and Give Life and there is a small poster she has produced that gives some detail but if you are interested in more information please use the email on the bottom to contact Victoria herself. Although I will not be able to attend, due to the distance and my health problems. I wish her all the best with this great event.If people cannot attend they could always give to the charity directly at the link. Holiday is over Back on your Heads! They are" Under Starter's Orders"